Do you feel helpless at times to change anything? Maybe alone you can’t do a lot, but as part of a worldwide team to alleviate hunger and provide refuge for people fleeing violence, YOU can make a tremendous difference. Church World Service links with networks like the Unitarian Universalist Service Committee in order to partner with grassroots efforts around the world and close to home addressing both urgent and long-term hunger issues. 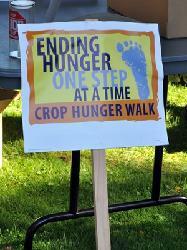 The money you raise as part of the CROP Walk in DeKalb will help fund water projects in Africa, urban agriculture in Haiti, relief for families fleeing wars in the Middle East, and Meals on Wheels in DeKalb County. This is YOUR chance to fight hunger. To show the world you care. You can help either by joining Team UUFD Freedom Walkers or by donating funds to the team. To join the team, go to http://www.crophungerwalk.org/dekalbil, then click the big blue "Register" button.